This is one of the most unique houses in Santurce. 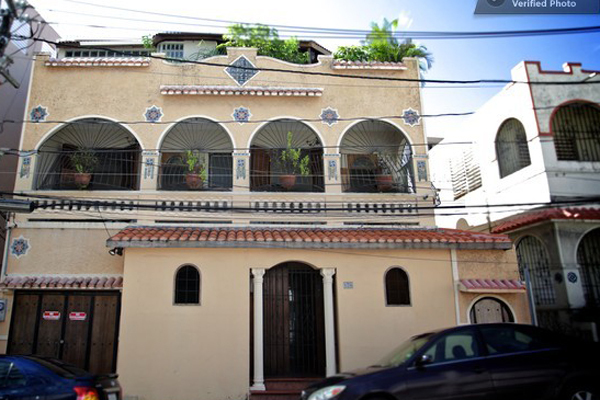 Originally built as a single-story house in 1915, the house was renovated with two floors after the trolly lines brought development to Santurce and 'Parada 24' in the late 1920's. There were only two previous owners prior to the current renovation - so much of the original detail has been preserved. Notice the iconic 'Santurce Mosaics' on the facade. The house also still has almost all of its original creole tiles on the first floor and second floor balcony. The house is especially interesting since the second floor addition was done in typical 'art deco' style with a deco supporting beam in the living room and unique stairway to the second floor. The first floor is currently used as the owner's professional space - but is actually the formal living room of the house. Garage is currently being used as an art gallery - but is fully functional to be used as a garage. The maid's 'casita' in the back of the house has been converted to a guest suite with 'gazebo courtyard', open kitchen/bar and king-sized bedroom with ensuite bathroom. Major renovations were done to convert the second floor bedrooms into the main living area with kitchen, dining room, 2 bedrooms and bathroom plus back deck and front balcony. Penthouse master suite occupies the entire third floor with wet bar, makeup station, walk-in closet, designer bathroom, bedroom with sliding wall, TV room and roof-top terrace/fountain. Bus stop to Old San Juan, Santurce and Hato Rey at the corner. Walk to Tren Urbano, Ciudadela's Pueblo Supermarket, Museum of Art. Only 3 blocks to San Jorge Children's Hospital.